Walking is one of the best cardiovascular exercises we can do. Luckily, it’s also an exercise we can do safely as we age. Finding the best treadmills for seniors isn’t that different than finding treadmills for the younger folks. It really boils down to knowing what you are looking for and then knowing where to find it. I’m here to help you on both tasks. After reading this article, you should feel confident in knowing what to look for in a proper treadmill for seniors. I will also present you some fine options I think would work well for most seniors. Why Should Seniors Walk For Exercise? As a geriatric physical therapist, I get a lot of first hand experience working with our aging population. It’s an interesting and challenging job that I really enjoy. I love meeting and working with different patients and their families. Trust me, I hear some great stories. But it can also be challenging finding ways to adapt exercise to meet the needs of my aging patients. A common goal most of my patients share is the need to improve their ability to walk safely. I see a lot of people that have been in the hospital for some medical reason and when they come home they are weaker and less stable on their feet. I also treat a lot of folks with balance disorders that are referred to therapy to reduce their future fall risk. As a therapist, I may have some “tricks” under my sleeve for helping my patients learn to walk more safely. But as I always tell my patients, the only way to get better at walking, is to practice walking. This sounds really simple, but it’s true. I spend a lot of time just walking with my patients because it improves strength and endurance and it’s a safe way for them to get the exercise they need. And these are just a few of the benefits walking can provide. Check out this article from the Arthritis Foundation for a more in-depth discussion. Unfortunately as we age, our lifestyle tends to become more sedentary. With time, this causes us to lose muscle mass, lose strength, and ultimately lose the ability to care for ourselves. I believe one of the best things we can do for ourselves as we age is to continue staying active. We all know the saying: “If you don’t use it, you lose it”. It’s very true. So besides all the health benefits listed above, the number one reason seniors should walk for exercise is to maintain the ability to safely walk. If we walk regularly, our chances of continuing to be able to walk are much higher. As we age we want to maintain our mobility as much as possible. Walking is how most of us get around each day and it’s something most of us don’t want to give up. Walking can be done anywhere and you by no means need a treadmill to walk for exercise. But it’s a nice tool because the weather is always nice inside your home. You don’t have to worry about walking around the uneven yard or driveway if you have a treadmill in your home. A treadmill offers a nice, comfortable walking surface year-round. So although a treadmill isn’t necessary, it can make things more convenient. I’m always happy when my patients have a treadmill (or exercise bike). When they do, one of our goals is often to get them back to the point where they can start using their equipment safely again. I love to see seniors incorporating exercise into their daily routine. Exercise is good for all of us, regardless of age! Finding the best treadmills for seniors might be a little different than finding a treadmill for younger individuals. Most seniors need a treadmill for walking (but I don’t want to imply that seniors can’t run). Seniors also tend to be less interested in the high-tech features such as bluetooth and workout programs. Incline and decline settings may not be as important either. Most seniors are looking for a treadmill that will allow them to comfortably walk on a flat surface. So, we should be looking for a treadmill that does just that. Luckily, when you take away some of these fancier features, you drastically reduce the cost. You may be thinking a manual treadmill would work well. I disagree. I don’t recommend manual treadmills for seniors because they are actually pretty challenging to use. Manual treadmills have a resting incline angle (that is, they can’t be set completely flat) which isn’t a very good idea for seniors. This makes the treadmill difficult to use. It also increase the stresses through the knees and hips. Don’t get me wrong, manual treadmills have their place. But not for seniors. You can also compare workout programs and fitness app compatibility if you want. Again, most of the seniors I work with aren’t interested in that stuff, but if other folks will be sharing the treadmill it might be important. Now let’s take a look at some great treadmill choices for seniors. I like the Lifespan TR2000e for seniors because of it’s electric folding mechanism. This is a really convenient feature that you don’t see on many treadmills, even the more expensive ones. As the name implies, this treadmill folds. This a nice feature to begin with because it saves a lot of space when not in use. But this treadmill will fold automatically with just the push of a button. This is a great feature for seniors because they don’t have to worry about bending over and fooling with folding the treadmill. Simply push a button and the rest is taken care of. I also like the simplicity of the TR2000e’s console. This treadmill actually has 17 different programmed workouts, but it also has quickset buttons that make it easy to step on and start walking. You can push the “quick start” button and off you go. It also has quickset buttons for speed and incline which makes it really easy for setting your preferences. The Lifespan TR2000e does have a safety key which is important to make sure the treadmill stops in case you lose your balance. The safety rails are of adequate length, pretty standard. But this treadmill does feature 8 different compression absorbing shocks throughout the deck. This shock system will help keep you comfortable during your workouts and reduce stress through your joints. Overall, the Lifespan TR2000e Electric Folding Treadmill has a lot to offer for seniors. The electronic folding and easy to use console make using the treadmill very easy. It has a decent size walking surface and a shock system to reduce stress through joints. I’d like to see the handrails a little longer, but no treadmill is perfect. This treadmill is priced pretty well and user reviews are mostly positive. This treadmill currently has a 3.8/5 rating on Amazon. The Proform 505 CST is another nice treadmill choice for seniors because it offers a comfortable deck and an easy to use console. I like this treadmill for seniors primarily because of the ProShox cushioning system Proform has developed for their treadmills. It’s a great shock-absorbing system that will reduce stress through joints during use. This is especially helpful for achy, arthritic knees and hips. The console on the Proform 505 CST is pretty standard. Nothing too fancy here. The treadmill includes 18 different workouts, however I like that it also has the quickset keys for setting speed and incline. The display screen is also pretty small on this treadmill, but it should be big enough for viewing the time. This is normally the only metric our seniors are concerned with. This treadmill does have an adjustable incline up to 10% and a max speed of 10 mph. This should be plenty to ensure you get a great workout whether you choose to walk or run. The Proform 505 CST is also a folding treadmill, however it has to be folded manually. It actually folds pretty easily, but after talking about the electric folding mechanism of the Lifespan TR2000e it seems a little disappointing. That really is a cool feature. The safety rails are standard length here. The ProShox cushioning system is the nice benefit of this treadmill. 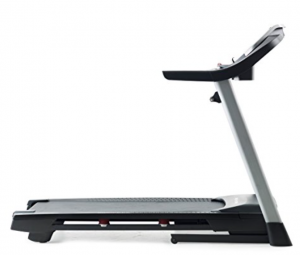 Proform treadmills are known for their high-quality cushioning. They are very popular because they are comfortable to walk and run on. I think seniors will really appreciate the added comfort. Overall, the Proform 505 CST Treadmill would be a great walking treadmill for seniors. The ProShox cushioning system is the highlight of this model and I think most seniors should find this treadmill comfortable to use. The console is pretty easy to use and this treadmill has more than enough power to offer a great workout. This treadmill is significantly more affordable than the Lifespan treadmill discussed above. At this price, the warranty is great and that is always a good sign. This treadmill is currently boasting a 3.8/5 average user rating on Amazon. The NordicTrack T6.5 S has a lot in common with the Proform 505 CST. Both treadmills have easy to use consoles, both treadmills fold, and they are both in the same price range. Personally, I would choose the Proform over this treadmill because of the ProShox cushioning system, but if for some reason you don’t like the Proform treadmills, this might be a good alternative. I like this treadmill for seniors because it has an adjustable shock system. You can adjust how much cushioning the deck has by turning the FlexSelect knobs. This is a pretty cool feature because most treadmills don’t allow you to do this. If you want more shock absorption you can adjust it that way. If you want a more firm surface (one that resembles walking on the road) you can also have that. The console on the NordicTrack T6.5 S is similar to the other treadmills we’ve discussed thus far. I do like that the display screen on this machine is a little larger, making the numbers a little more visible during use. This treadmill also offers the one button selections for speed and incline. The T6.5 S offers 20 different workout programs. If you are looking for a treadmill with plenty of workouts, this would be a good choice. It also has a power incline up to 10% which should be more than enough to get those legs burning. The safety rails are a little short on this machine. I would like to see them extended out a little. This treadmill does have a safety key with emergency stop. It also has a hand grip heart rate monitor which comes in handy during workouts. Overall, the NordicTrack T6.5 S treadmill is a great option for seniors. It has an easy to use console, large display screen, and adjustable cushioning system. It doesn’t have many fancy bells and whistles, but most seniors aren’t looking for that stuff. They are looking for a treadmill that is easy to operate and comfortable to use. The T6.5 S is currently rocking a 4.0/5 average user rating on Amazon. At this price, this treadmill is tough to beat. The Nautilus T614 treadmill has a few more bells and whistles than the previous machines discussed. I think this would make a nice treadmill for seniors because it has a nice shock absorbing deck and it has a large console. This treadmill has standard length safety rails, but it does have plenty of spaces in the front for holding on during use. I mentioned that this treadmill offers a few more features than the other treadmills on this list. For one, the Nautilus T614 has speakers and a USB hookup. This can be used to charge your phone or pad during use. This treadmill also has a connection where you can hook up an mp3 player for music. It also has a media shelf for holding a book or magazine (or pad) during use. The console is large and easy to read. This treadmill offers 22 workout programs and it too has the quickset buttons which make it really easy for setting your speed and incline. These buttons are great for seniors because they can step up, hit start, and choose their speed with the push of a button. The Nautilus T614 is also a folding treadmill. It’s not automatic, but it is easy to folds or storage. The cushioning system on this treadmill is referred to as the StrikeZone system. It’s designed to absorb shock while you walk or run so that less stress is going through your joints. Users appreciate the comfort this treadmill offers during use. This treadmill also has a grip heart rate monitor. Actually, some of the workout programs are designed around your heart rate. These programs monitor your heart rate and alter the speed and incline in order to make you work hard enough to keep your heart rate within a certain zone. This program may not be suitable for seniors, but keeping track of heart rate is nice during exercise, especially if you have a history of cardiac issues. Overall, the Nautilus T614 is a nice option for seniors. It’s powerful enough and big enough to comfortable walk or run on. The belt has a nice cushioning system and the large console is easy to use and easy to see. Nautilus doesn’t offer a very good warranty on this treadmill however. This treadmill currently has an average user rating of 3.9/5 on Amazon. It’s a pretty good buy at the sale price, I wouldn’t pay the full price however for this model. Last, but not least, comes the Exerpeutic TF1000 Electric Treadmill. I like this treadmill for seniors because it has over-sized safety rails on both sides. This is a great feature for seniors looking to safely walk indoors. The long safety rails are my favorite part of this treadmill, but there are a few other key points I’d like to point out. This is the least sophisticated treadmill on this list. It’s also the most affordable. The other treadmills on this list would be able to support walking or running. The Exerpeutic TF1000 however, should only be used for walking. The motor on this treadmill is only 1.5 HP. This just isn’t enough power for running. It would work fine for walking though. The Exerpeutic TF1000 has a very simple console. There are no programmed workouts or power incline. The console consists of a small display screen that will show time, distance, speed, calories, and heart rate (yes, it does have a grip heart rate monitor). This is great if you are looking for an easy to use treadmill with no fancy features. This treadmill does have a safety key for emergency stopping. That might actually be required on all electric treadmills. It does have 2 manual incline settings, but no power incline like the other treadmills provide. This treadmill also folds for easy storage. Overall, the Exerpeutic TF1000 treadmill is a nice option for a senior who is looking for a simple machine to walk on. This machine has a top speed of 4.0 mph, so it really is only designed for walking (and not speed walking). It’s very affordable and has an impressive weight capacity- 400 lb is actually more than most of the higher-end machines. The key feature of this treadmill is definitely the safety rails though. This would make a good treadmill for seniors with balance issues because the longer rails could almost act as parallel bars. The Exerpeutic TF1000 is currently boasting a 3.9/5 average user rating on Amazon. 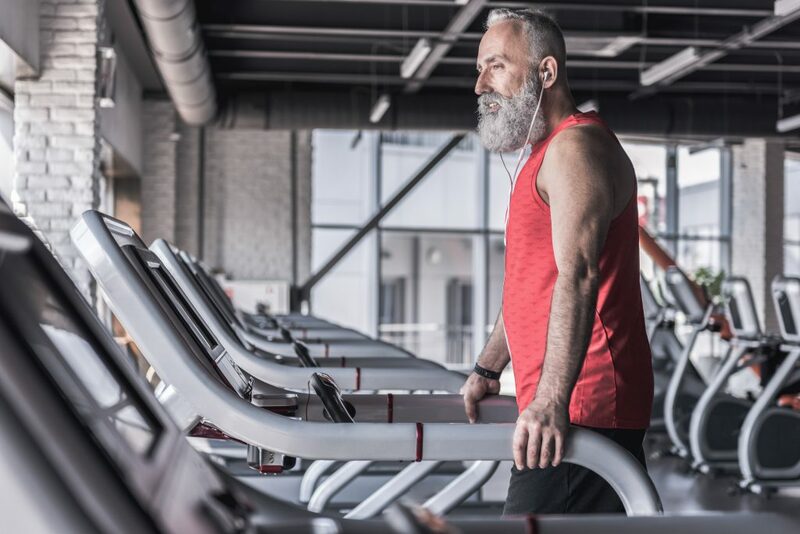 I hope this article helped point out some of the key features you should consider when looking for treadmills for seniors. Seniors should consider comfort and ease of use when making a selection. I would also suggest staying away from the manual treadmills because they end up putting more stress through your joints and it takes more effort to keep them moving. These are the 5 best treadmills for seniors currently on the market. There are obviously nicer treadmills than the ones discussed here, but most seniors are looking for a walking treadmill. Most seniors also aren’t as concerned with the high-tech features. Considering these factors, I recommend the above treadmills. Each treadmill made the list for a certain reason. Some for their cushioning system or console, others for their safety rails. Turns out all of these treadmills are folding (that was a coincidence). If you are interested in one of these treadmills, I highly recommend clicking on the above buttons and reading more of the user reviews. If you have any questions or comments, leave them below and I’ll get back to you. The Wonder Core Exercise Machine- Does It Actually Work? How do these compare with the Horizon 101- horizon has a patented cushioning system. Is it anywhere close to these? The Horizon T101 is a great treadmill for the price and comes with a great warranty too. It’s very comparable to the treadmills mentioned here. At 55″, the deck is a little on the short side, but should still be comfortable for walking. Their cushioning system is a little different from the treadmills listed here. The T101’s deck has different levels of shock absorption based on the location of the deck (front vs middle vs back). This is supposed to make running and jogging more comfortable, but honestly I’m not sure how much difference it really makes. If cushioning is a primary concern, you’re probably better off with the Proform 505CST with it’s ProShox cushioning. But overall the T101 is a nice treadmill for walking and light jogging. It actually made my list for best treadmills of the year.